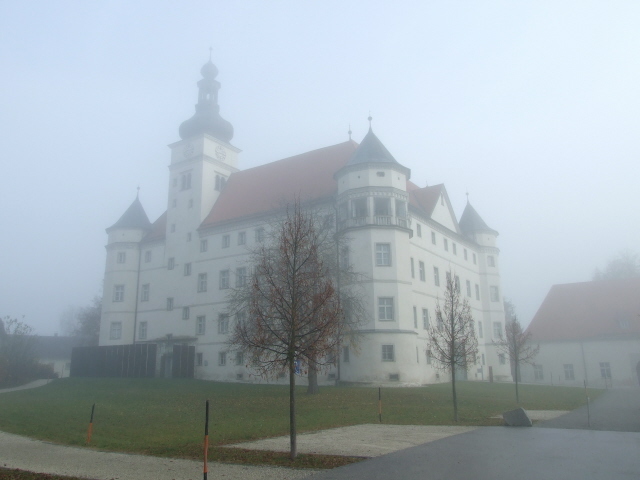 Of the six "Aktion T4" Nazi euthanasia centres, Hartheim in Austria was the most murderous. Long a rather neglected site, it is now not only a remarkable memorial but also houses two sets of excellent topical exhibitions. However: without a good knowledge of German international visitors won't get as much out of many parts of the memorial as one would wish. More background info: Schloss (= castle) Hartheim, originally built in ca. 1600, had been a care home for people with mental and multiple disabilities since 1896 when it was taken over by the Nazis in 1938/39. Once WWII had started it then became one of the six centres of the "Aktion T4", i.e. it was a killing centre, firstly for the former inmates of the Hartheim care home and numerous other such institutions (e.g. Spiegelgrund/Steinhof in Vienna) but secondly also for inmates from the concentration camps of Mauthausen, Gusen and Dachau, in particular ones who were no longer fit for work. Hartheim's primary function, though, was the systematic murder of mentally ill patients. This was euphemistically, and cynically, called "euthanasia". 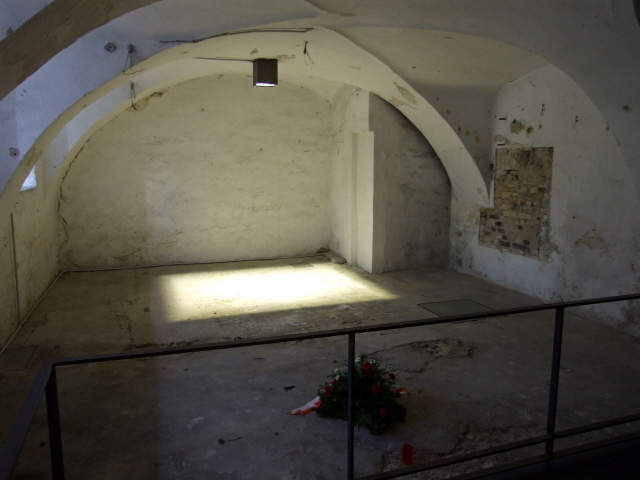 For this purpose a gas chamber and a crematorium were installed in the ground floor of the castle. In fact, Hartheim was the worst of the six T4 centres by sheer numbers of those murdered here: about 30,000 names are known, but there may have been even more victims. Hartheim is also important in terms of historical research because of the "Hartheimer Statistik" – a brochure found by the US liberators after WWII which documents the main initial wave of the murders, called "disinfections" in these papers, in exact numbers of dead per month (over 18,000 in total) and also calculates the sums "saved" by the killings (i.e. money that would have been spent on care – it's clear evidence of the cold economical considerations that form part of the eugenics/euthanasia "ideology"). After the Aktion T4 was officially ended in August 1941, killings still continued at Hartheim, albeit in even more secrecy. In 1944 the installations used in four years of systematic murder were dismantled and removed – in an attempt to cover up the crimes perpetrated here. It is also noteworthy that the Aktion T4 gassings were in part a precursor to the most murderous phase of the Holocaust – and in fact some of the personnel was the same! For instance, Franz Stangl and Christian Wirth who had both worked at Hartheim and other T4 centres (Bernburg, Grafeneck) later became commandants of the "Operation Reinhard" death camps in eastern Poland (Belzec, Sobibor, Treblinka). After WWII, the US occupation authorities handed the castle back to the original owners (whom the castle had been taken away from by the Nazis). 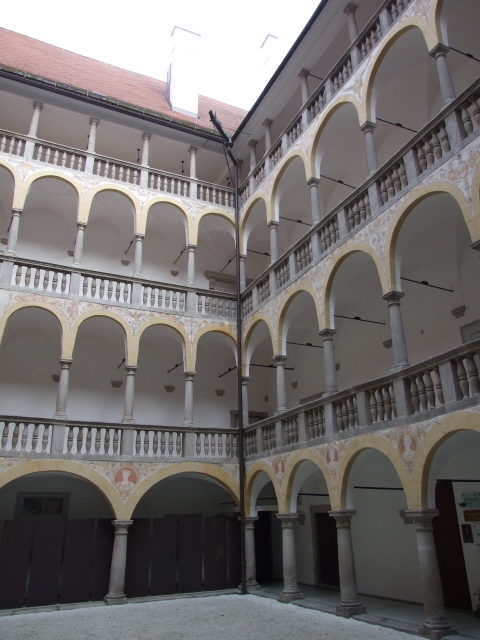 Initially, the building was then used to house refugees. In the 1960s a small memorial was first set up – and the memorial plaques moved from the courtyard to this indoor memorial room (they're now back in their original place). It wasn't until the mid/late 1990s, however, that the government agreed to finance the setting up of today's proper memorial and exhibitions. These opened in 2003. Finally, then, this sinister place from Austria's darkest chapter during the Nazi period is now an appropriate place not only for commemoration but also for information. Hence the official double name "Lern- und Gedenkort" – 'place of learning and remembrance'. In addition, the nearby Institut Hartheim is again an institution for appropriate (modern) care for people with multiple disabilities – some even work in the café next to the castle as part of an integration programme. For the dark tourist, Hartheim makes a very worthwhile stopover when travelling in these parts of the country (esp. to go and see Mauthausen, Austria's No. 1 dark site – at least outside Vienna), even though it is only some parts of the ground floor exhibitions that have translations in English (for everything else you need to know German). 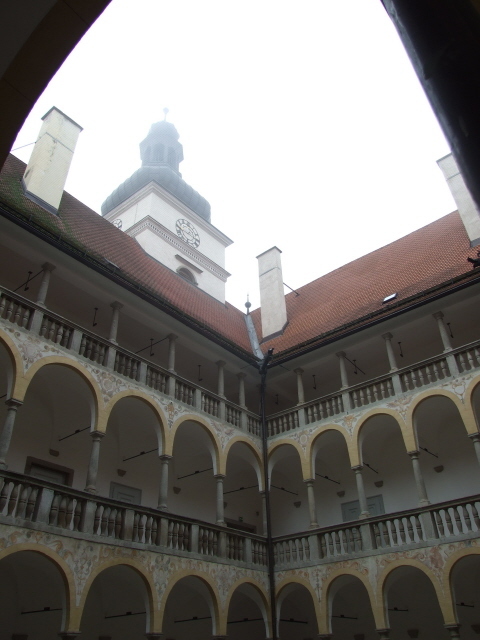 What there is to see: As you enter the colonnaded courtyard of the castle, you can see a cluster of memorial plaques on the wall to the right – remarkably, though, these mostly commemorate victims of the Mauthausen and Dachau concentration camps rather than those of the "Aktion T4" euthanasia programme. 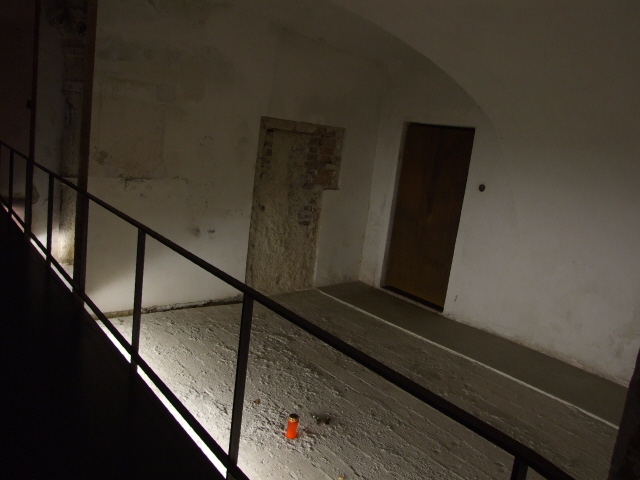 Behind this wall is a "meditation room" and beyond that the series of rooms in which the killings took place between 1940 and 1944. This is the core of the memorial. You can visit it straight away – or rather come back to it after having seen the rest of the exhibition. 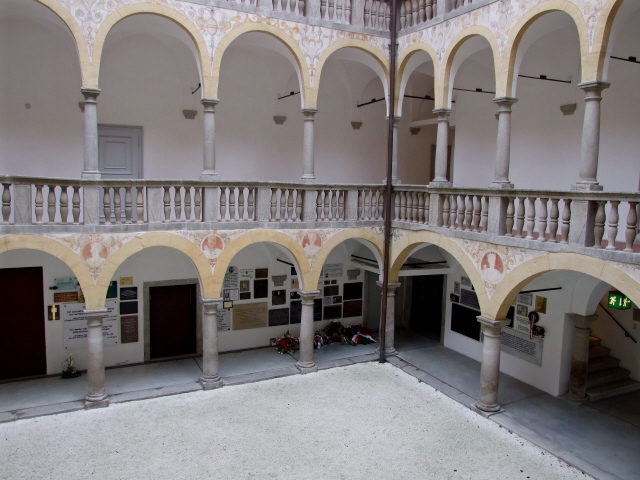 To get to the starting point of the exhibition (if you want to follow the expected order of viewing), you need to go to the corner at the far end of the left (western) side of the courtyard. Here a hole has been made in the outer wall to lead you into a stylized memorial installation that roughly recreates the area where the shed used to stand in which the buses with the victims arrived. Another (sliding) door then leads into the first exhibition room proper. In a series of three rooms, the Nazi euthanasia system (see Aktion T4), Hartheim's role in particular, and the backgrounds of perpetrators and victims are illustrated – mostly by means of photos and texts, but also by means of a few artefacts, such as old asbestos gloves as evidence of the fact that there was a crematorium at Hartheim, as well as some personal items that belonged to victims. These personal effects were found only recently by chance during excavation work in the garden, so they are pretty remarkable archaeological finds, really. 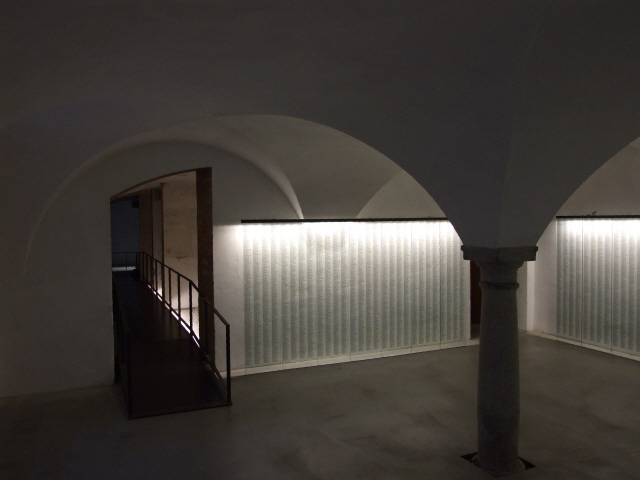 The core of the memorial, the rooms in which the actual killings were performed, are rather chilling even without any language (but signage and explanations in English are also good in this part). You walk on a slightly elevated walkway through the rooms – which is deliberately intended to "distance" the visitor from the authentic floors. 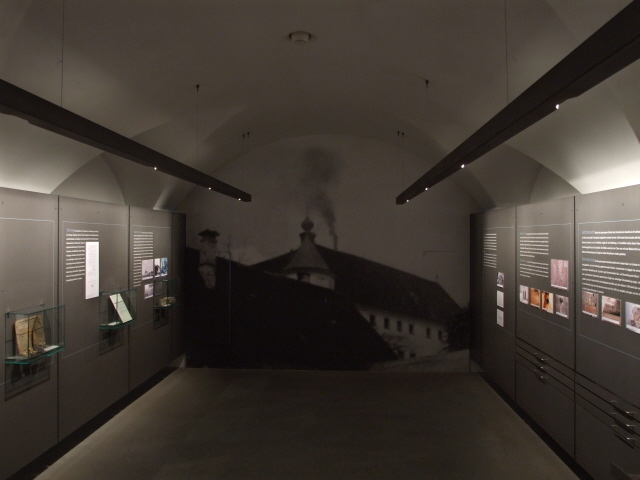 The first and largest room in this section was the "admission room" where victims would have been led to first, made to undress, photographed for the files (which were later destroyed), before being led into the adjacent gas chamber. The room today is mainly bare save for glass panels with the names of the victims printed on in dense small script – which only emphasizes the scale of the killing programme! A block in the corner by the bay windows represents the archaeological finds: you can see victims' personal belongings caked together in soil. 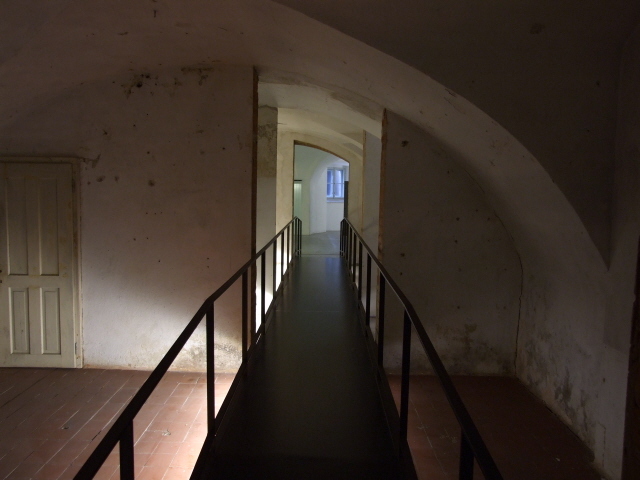 The right-hand corner of the "admission room" is where the elevated walkway begins which takes you through the now entirely bare gas chamber, the room for the technical installations (long since removed), the morgue and finally the crematorium (ovens gone too). These rooms are empty, except for a single red candle in the gas chamber and a bouquet of flowers in the former crematorium, but they ooze a truly sinister atmosphere. This finishes the actual memorial part of the site. There's another separate exhibition entitled "Wert des Lebens", or 'value of life', mostly on the second floor, which covers topics such as the changing attitudes towards and treatment of disabled people at the times of enlightenment, industrialization, the heyday of eugenics, and modern ethical issues concerning biosciences and genetics. Also illustrated are the problems of disabled people in contemporary society. There are, however, no English translations in these sections! So if you cannot understand German, they can be skipped or just quickly scanned. Therefore they are only described in more detail in the German version of this chapter. If you still do go and scan through this exhibition, then you want to look out for one particular exhibit that is actually in English itself: it's to be found in the eugenics section and is from the USA. It's a chart that is shockingly discriminatory in the very same "eugenics"-driven way familiar from Nazi propaganda (although theories of eugenics were popular in many countries at the time, including Great Britain). For instance, it points out that "[e]very 15 seconds $100 of your money goes to the care of persons with bad heredity" such as the "insane, feeble-minded, criminals and other defectives" (note that even 'criminal' is regarded as heredity!) 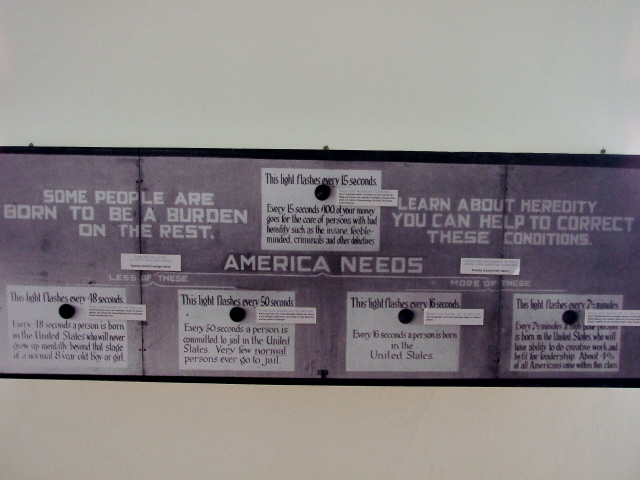 and goes on that "America needs less of these" – but more of healthy babies and persons "fit for leadership". It's a chilling reminder that the twisted thinking of eugenics which underlay the "Aktion T4" was in the 1930s by no means confined to Nazi Germany alone. Only it was the Nazis that for ever discredited this "theory" or "ideology" (although, maybe not forever … in some form it may be resurfacing under a more modern genetics driven guise – how far off are we from health insurers insisting on a genetic screening and basing their rates or even acceptance on this? … not very far is my guess …). In a lower building next to the castle proper there's a café, which fittingly also is a project (initiated the nearby Institut Hartheim for people with multiple disabilities) for the integration of the disabled: its waiting staff consists of disabled and non-disabled people working together. Note, however, that the café is closed at weekends and closes early on Fridays (already at 12:30, 5:30 p.m. otherwise). Location: just half a mile south of the little town of Alkoven, some 10 miles (15km) west of Linz, in Upper Austria, a good 100 miles (150 km) west of Vienna. Access and costs: off the beaten track but not too difficult to reach, small entrance fee for the exhibition. Details: To get to Hartheim by public transport you take the train to Alkoven village next to Hartheim and walk. The train is a special regional one called "Linzer Lokalbahn" or "LiLo" for short, which takes about 30 minutes. In the past it was a bit of a hassle finding the relevant station, but since 2005 the LiLo has been integrated into the new central station (Hbf) at Linz. The trains go either to Neumarkt or Peuerbach via Eferding. Alkoven is the 14th stop (after Wehrgasse – you may have to push a button to request a stop). Alternatively, there are also buses (ÖBB Postbus) to Alkoven and regional buses in Alkoven going closer to Hartheim (for connections see oebb.at and/or ooevv.at). But you can walk it from Alkoven station: you can see the white castle's silhouette from afar, so orientation shouldn't be a big problem. Just cross the train tracks and proceed past some grain storage towers along the road to Hartheim. There's no real pavement so watch out for traffic. When you come to a roundabout, don't take the new bypass but carry straight on along Schlossstraße – it'll take you right to the side entrance to the castle complex to its eastern side. By car get the A1 motorway from Vienna or the A8 from the west (e.g. Passau in Germany). The overland road 129 goes straight through Alkoven. From the east you can either go via Linz, along the city motorway A7, exiting at "Linz-Hafenstraße", which already is the 129. If you'd rather avoid having to drive in Linz (which is understandable, as you can easily get lost there – I always do, or at least nearly do, whenever I'm there) then you can carry on along the A1 and get on the A25 (towards Passau) and take the exit at Weißkirchen but turn right towards Marchtrenk onto Mauthausstraße. Carry on straight through Marchtrenk and fiddle through the villages of Oftering, Axberg and Winkeln. This will get you to Hartheim from the south, without passing through Alkoven first. When coming from Linz on the 129 look out for the sign that says "Lern- und Gedenkort Schloss Hartheim" just before the train station (the sign appears suddenly – I missed it first time around and had to turn back, so it pays to pay attention …). Proceed towards the castle looming large and white in the distance, and at the first roundabout take the bypass to the right (following the signs) and at the next one the second exit into Axberger Straße, which will take you to the castle's car park (free). Coming from the west you can either exit the motorway at Weißkirchen and fiddle through as above, or exit at "Pichl bei Wels" and get the B137 (towards Wallern) and the B134 to Eferding, where it connects with the B129. Coming from the south along the A9, carry on along the A8 past Wels, exit at Pichl and proceed as above. As you would want to expect of a site with such a history, it's all fully wheelchair accessible – including, obviously, the toilets. These are not even marked "disabled" … they're for everyone, no discrimination made (except for that between female and male, of course). Time required: To see the building and the main exhibition on the ground floor will take something like an hour – double that (at least) if you can understand German and want to go through the upstairs exhibitions to the full too. Combinations with other dark destinations: Thematically, the other five euthanasia centres of the Aktion T4 would be matching combinations, only they are all far away scattered over Germany. Closer by, on the other, eastern side of Linz, however, the impressive Mauthausen concentration camp memorial is a must for any dark tourist in Austria. Nearby Gusen makes another good add-on. And it's also connected to Hartheim: inmates slated for execution were occasionally sent to Hartheim to be gassed there. 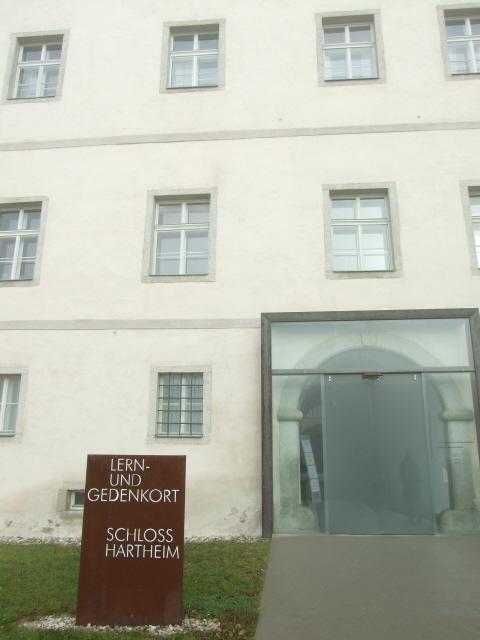 Mostly, however, people sent to Hartheim came from psychiatric institutions such as Vienna's Spiegelgrund/Steinhof.